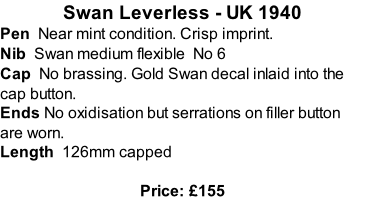 Pen VG condition with 9ct gold bands. Imprint barely visible. No brassing. Cap No cracks or marks, no brassing on gold plated clip. Pen Excellent condition with strong imprints. Wide pierced band with no brassing. Has (unusual) black blind cap. Filler button shows ink level, but less transparent than is should be. Nib Medium No 2 highly flexible. Cap No cracks or marks, no brassing. White Swan logo on cap top. Pen Lapis ring-top lever filler. Very Good condition. Clear imprints on barrel and barrel end. Slight pitting to the plating on the lever. Cap No cracks or marks and no brassing. Pen Excellent condition. Chrome trim. Good imprint. Pen VG condition with gold plated bands (small areas of brassing). Imprint strong. 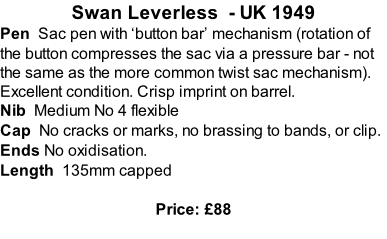 Lever tip brassed. 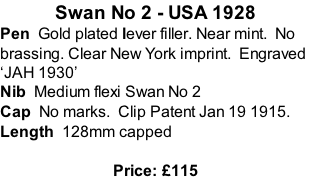 Nib Fine Swan No 2. Cap Clipless cap. No cracks or marks. 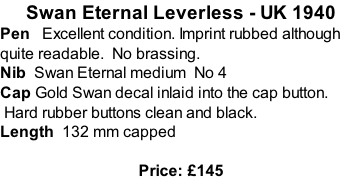 Idiosyncratic cap top is original! Pen Red ripple hard rubber lever filler. Lever black hard rubber. Near mint condition. Nib Mabie Todd Swan No 2 medium. Medium flexibility. Pen Vacumatic type filler of similar design to the Visofil VT. Excellent condition with no brassing. Cap Excellent with no brassing.